← Deep Blue Your Body Blues Away!! New products are here to get your Spring Cleaning going! 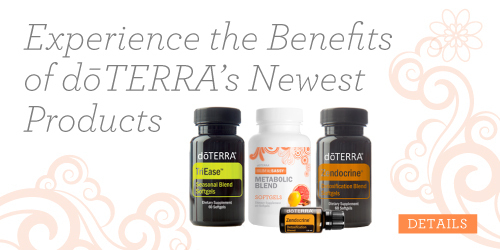 Get healthy from the inside out with doTERRA’s new TriEase, Slim & Sassy & Zendocrine, which ALL come in Soft Gel form!!! No more filling up empty capsules, these are a convenient way to get your oils in on the go! TriEase Soft Gel: Seasonal Blend, protect against seasonal threats with this amazing blend of Lemon, Lavender & Peppermint! Zendocrine Soft Gel: Detoxify from all the holiday & comfort foods we’ve been eating, toxins from plastic water bottles we drink out of, pollution, along with toxins we come in counter with on a daily basis. This product is available starting in May! Releasing built up toxins: We focus on detoxifying and cleansing the system. Detoxification is key to releasing built up, stagnant toxins that hinder the body. Rebooting is vital for the body to function at the levels that are necessary for real health. We are inundated with toxic overload, including the air we breathe, chemicals found in food, cleaning supplies, and more. We will be working primarily in aiding the liver in detoxification. 14-Day Detox: Email me to learn about our detox program. Lose weight and detox from heavy metals & toxicity with our whole food detox program. Normally the program goes for $89 plus $275 for the product but email holisticbritt@gmail.com to learn more about how you can get the program FREE! !